It's so easy to create a delicious and wholesome pot roast dinner in the slow cooker. 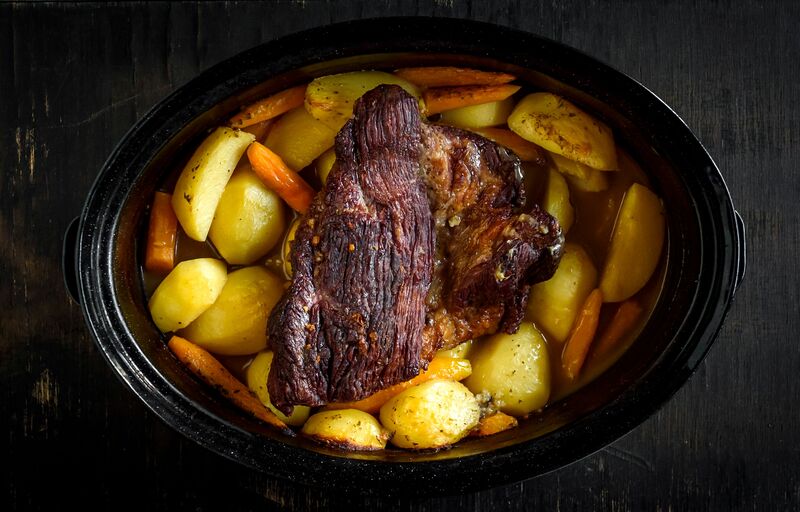 From hearty vegetable pot roasts to barbecued beef sandwiches, there are many simple and tasty pot roast recipes to choose from. Not only will you be feeding your family a nutritious home-cooked meal, you'll also save time and money. It's a win-win for everyone. This simple pot roast includes vegetables and onion soup mix. Add to that a can of cream of mushroom soup and it comes together with only four ingredients (plus water). It does not get much easier than that. Serve this delicious pot roast for a busy weeknight dinner or simple Sunday supper. Add barbecue sauce and pinto beans to the slow cooker with your pot roast. It's fabulously simple and requires very little effort to create a wonderful meal the whole family will love. Serve it alongside potato salad and slaw for a barbecue-style dinner. This pot roast is slow cooked to tender perfection with a flavorful homemade gravy. It's a hearty meal in one pot, complete with potatoes, rutabaga or turnips, carrots, onions, and mushrooms. Since everything you need for a balanced meal is in the cooker, simply serve it with bread and whipped butter. This delicious combination of seasonings includes onions, canned diced tomatoes, red wine, and garlic. Preparation is a snap, and the slow cooker makes cooking so easy. To complete this meal, serve a simple spinach salad as well. Chili seasonings give this easy pot roast Southwestern or Tex-Mex flavor. Serve the pot roast with rice or potatoes and corn for a delicious everyday meal. You can also use the roast to fill warm tortillas or save that idea for leftover night. Au jus and Italian dressing mixes are combined with chopped pepperoncini to flavor this fabulous pot roast. 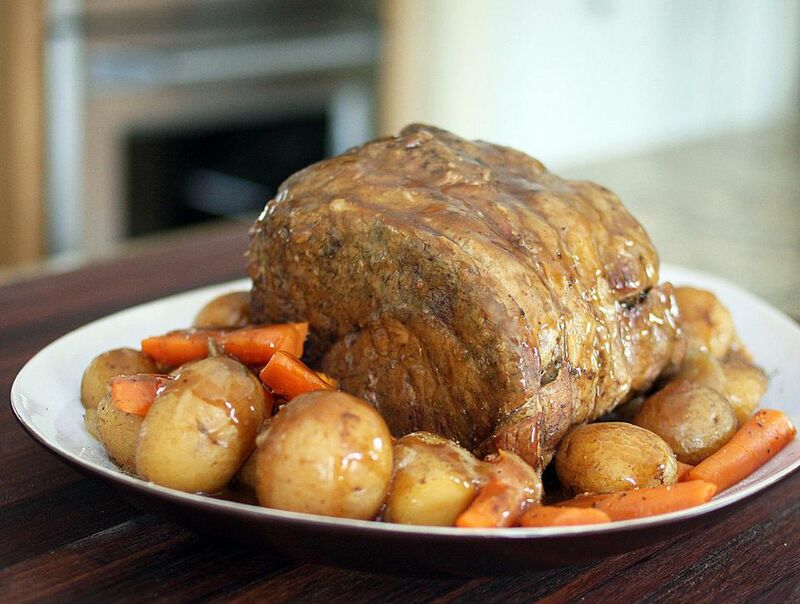 The roast is slow cooked to perfection, then it's shredded and served on toasted split rolls. Add a side of steamed vegetables to the plate. It's fabulous with broccoli and cauliflower. This slow cooker beef is made with a homemade barbecue sauce and a boneless chuck roast. It's surprisingly easy and very likely you already have everything you need. Serve this flavorful roast with potato salad and a tossed salad or slaw. It makes delicious sandwiches, too. One of the more unusual pot roast recipes, this one's a surprising delight. It's slow cooked with garlic, red wine, instant coffee, and seasonings. Finish off the homestyle plate with fluffy mashed potatoes and sour cream. You're just three ingredients away from an amazing pot roast sandwich. Simply add garlic and pepperoncini to the slow cooker and you're done. Use the beef for sandwiches or try it with pita bread and add chopped peppers and fresh tomatoes. This pot roast is made with fresh sliced mushrooms, tomatoes, and condensed onion soup. Preparing it is a cinch and leaves you with a worry-free and wholesome dinner. Serve this one with potatoes and spinach or your favorite vegetable for a fabulous meal.